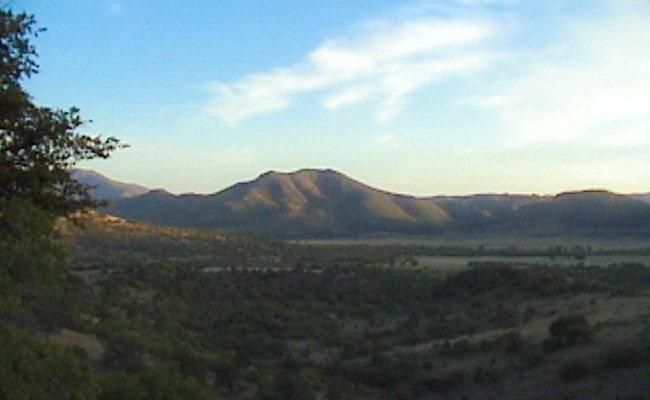 No, it’s not an oil painting…just a low-res video frame captured in 2004 in the Davis Mountains of western Texas, one of my favorite parts of North America. Stumbling upon a valley this beautiful, bathed in evening sunlight, is certainly just cause for stopping and gawking. But it was on the return trip in the dark of night that my mind was completely blown. Parking in this same spot and shutting off the engine and the headlights, I was immediately swallowed by darkness and silence of an intensity that I had never before experienced. Once the shock abated to the point where I could actually move, I got out and walked over to the rim of the valley. Now, the darkness was no longer darkness. There was starlight…incredible starlight. Though there was no moon in the sky, the blazing stars were bright enough to reveal the outline of the hills in the distance, and then the patchwork of trees, brush and grass. As my eyes continued to adjust, I could even discern various shades of green. The air was quite still, but soft sounds began to emerge…a bird rustling in a nearby bush, a pebble rolling a short distance down the hill, and the zing of a few insects, likely some species of cricket. While I was awed by what I was seeing and hearing and feeling, I was equally thrilled by what was missing from this moment: The twenty-first century. The panorama contained no power lines, no cell towers, no buildings. I scanned my entire 360-degree vista and was elated that I could not locate a single artificial light source. From where I stood, there was absolutely no visible sign of human influence other than the road and the car behind me, which I dared not look at for the next several minutes; no audible sign other than the fading metallic tick of the Pontiac’s engine cooling in the night air. I don’t remember how long I stood there in my hypnotic state, but I was lucid enough to know that I didn’t want to leave. Once I did depart, I knew that I would never forget how it felt to look across that valley on that night, and to know that, for a few moments, I had it all to myself. Large tracts of unspoiled wilderness have always fascinated me, and I’ll continue to seek out such places…on the plains, on the tundra, in the mountains and in the desert. I’ve been to a handful of locations that were also quite sublime in their raw beauty and silence, but this one stands out as my favorite. Even so, I hope it won’t be long before it moves down to second place. I plan to return to The Spot the next time I visit western Texas. Is it too much to hope that, after eleven years, the valley is still pristine? This entry was posted in Exploration and tagged Dark sky, Davis Mountains, Desert, Milky Way, Mountains, Night sky, Stars, Texas. Bookmark the permalink.